This is a fairly random post. I was listening to a radio program of a knowledgeable guy who repeatedly called the magazine of a pistol the "cartridge." Now, he's been in radio for a long time, so I'm sure he remembers inserting cartridges into players and he blanked on the proper term. Still, since so many people really don't have much knowledge of terminology, I thought I'd toss up a post on it. 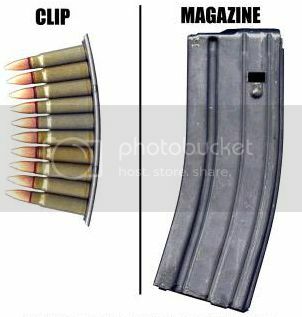 A clip is actually a device that holds rounds of ammunition in a convenient way so that they can be inserted into the internal magazine of a firearm. In the above picture, the clip is the silver strip holding the ends of the rounds (those look like 7.62 x 39 mm, and I've used a similar clip to quickly load an SKS rifle for a match). The rounds are often slid off of the clip into the magazine. The clip just makes them easy to load. Clip loading systems have mostly been replaced by the more modern box magazine. That's the recognizable black thing on the right above. 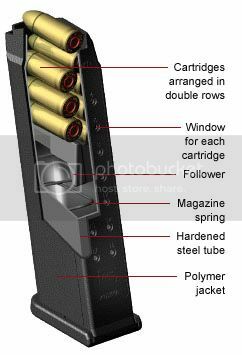 A detachable box magazine (people often just call them "mags") holds rounds of ammunition, and can be quickly inserted into a firearm. It's quicker than a clip. Below is an example of a pistol magazine (the one above is a rifle magazine). Really high capacity magazines are usually called drum magazines, which is no shock given what they look like. In the below image it's the part sticking out below the rifle below where you'd normally see a normal box or banana magazine hanging out, forward of the grip and trigger guard. It's just the small piece of metal that flies out of the end of the gun. 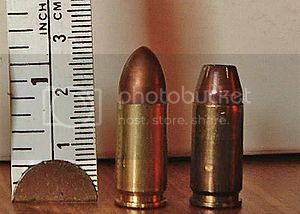 The pictured bullet is a hollowpoint handgun bullet. Rifle bullets are often longer and more pointed (though some handgun bullets are designed to come to a sharper point, too). Rounds consist of several parts. The shiny brass part is the shell casing (you can also call rounds shells or ammo for short). The top part is the bullet. Inside there will be gunpowder and at the bottom end, a primer that ignites the gunpowder when struck by the firearm's firing pin. In a semiautomatic firearm, the casing will be ejected out of the side. In a revolver or bolt action rifle, the casing is manually removed with the aid of an extractor. While this isn't the most exciting post you'll ever read, now you can wow your friends with all your impressive knowledge of terminology. Now it's true, you don't hear about those casualties in Afghanistan on the news anymore. Unfortunately, that's not because they're not happening, but because the media is biased. Joe, that's not better in any way. And I strongly suspect the biggest fear of our service members isn't Obama failing to get reelected. In fact, most of them will probably be casting votes for Romney. Sometimes, a disgusting lie is accomplished simply by leaving out a word. The cry from the left to justify illegal aliens stealing resources paid for by citizens and lawful residents is, "We're a nation of immigrants!" We absolutely are. Immigration of people who want to come here to become part of this nation, who want the freedom to implement good ideas are crucial to this nation. They refresh us. Their excitement at the opportunities they find in the U.S. is refreshing and renews our own enthusiasm. We're a nation of lawful immigrants, immigrants we welcome with open arms. So, it's particularly aggravating when pandering political hacks like Los Angeles Mayor Antonio Villaraigosa lie about conservatives by omitting a word. He did what the Left always does. He left out, "illegal." I'd be okay with illegal immigrant, even though "immigrant" suggests lawful entry, so "illegal alien" is more appropriate. The best analogy I've ever heard to illustrate the point is that calling conservatives "anti-immigrant" is like calling Mothers Against Drunk Driving "anti-driving." That missing word is critical. Leave it out and you're painting a strong cause supported by most people as some sort of fringe group to be ridiculed and shunned. It's a clever tactic, but one that exposes the Left as liars who can't win their argument without deception. Last week we passed an historic point in U.S. history. We're now more than 16 trillion dollars in debt. As we dig ourselves deeper into the hole of debt, I thought it would be appropriate for a reminder about debt and national security. WASHINGTON, Sept. 22, 2011 – Debt is the biggest threat to U.S. national security, Navy Adm. Mike Mullen, chairman of the Joint Chiefs of Staff, said during remarks to business executives today. Debt isn't just a threat to our security, though. I firmly believe it's immoral to incur debt to be passed to future generations. Thomas Jefferson agreed. Jefferson had significantly more to say on the subject, and I found a collection of his quotations in a post at the very progressive Current TV. If you go to Current, you'll not the comments about these quotations being out of step with the times. That's the same argument they use for the Constitution. Naturally, the indecency of recklessly contracting debt for someone else's children to pay off has nothing to do with the times in which we live. In fact, one would expect modern people today to have more respect for others, especially future generations. You've probably heard we're up for another vote on "extending Bush tax cuts" in a few months and the Democrats don't want to do that for people making more than $250,000 per year. The problem is that many small businesses file on individual tax returns. They don't net more than $250,000 year, but since they do gross more than that, they'd be subject to tax increases. What's the probable result? If each of the affected businesses had to cut two employees, we'd lose about 1.8 million jobs. Thanks, Democrats! The video's a bit older, but the situation hasn't changed. Raising taxes will at least cost jobs, and will probably put some of these small businesses out of business completely. The 15th post of the Armed Citizen is a bit of a milestone. The goal of these posts is to consistently demonstrate that lawful owners of firearms are saved from harm, often by the simple presentation of a firearm, far more often than whackjob criminals go out and commit atrocities with guns. The difference is the media loves to cover the whackjobs much more than the lawful citizens. In part, that's simply sensationalism to sell ads, but it's hard to argue against the fact there is an anti-firearm bias in the news that isn't justified by either statistics or anecdotal evidence. Note: It's very frequent that the criminals think things are like what you see on television. If the criminal pulls a gun, he will be unopposed, get what he wants, maybe hurt someone, then leave. Only the police can come and stop him or investigate the crime. When that preconceived scenario is firmly dissolved, criminals seem to flee. This is an indisputable win for the lawful firearms owner. In this story, no one was killed, but he criminal was stopped, the business owner suffered no loss, and the criminal very likely will think twice about ever attempting this again. Note: As opposed to the "Scenario-driven" criminal above, hardened criminals seem to try to execute their plans no matter what obstacles they encounter. Many of these stories also involve drugs, which would help explain unreasonable insistence by criminals in the face of credible resistance by their intended victims. The loss of human life is a always a tragedy, but it is always better that a felon multiple times over should lose his life while trying to victimize someone than that the crime succeed, possibly with innocent loss of life. It is a sad truth that what the courts can not stop will sometimes only be stopped by a justifiable homicide. This indicates a problem with our system; situations should never come to that. Someone who has committed 7 felonies should never see the outside of a prison again, so an innocent citizen is never faced with the imminent fear of death that forces him to take a criminal's life and live with the very real psychological and often legal repercussions of that act. Even when the criminal does not survive to brutalize, the lawful citizen is often still made a victim. That also indicates a problem with our system. There can be no more basic nor noble instinct than that of a mother protecting her children. That this woman had to use deadly force is awful. That she saved her three children is a testament to the power and necessity of lawful self-defense. I have always said that the police should feel very comfortable with the idea that should they find themselves in trouble, lawfully armed citizens with the proper training will show up to help. What criminal would open fire or otherwise attack an officer if he knew 5 armed citizens might show up and aid the officer? I've never understood the hostility displayed toward lawfully armed citizens (or the mere idea) by some law enforcement departments.